This book is a salutary reminder that the realities of British politics before 1914 were more complex and rather different from the ‘whiggish’ stereotypes about New Liberalism, and the rise of Labour and class politics which have dominated our understanding of late Edwardian Britain. Jackson’s groundbreaking research shows that from the start of the Third Home Rule Bill crisis, there was in Britain considerable popular interest in the Irish issue, and that the Curragh army mutiny of 1914 was not an isolated incident, but part of a wider popular movement. A well-orchestrated campaign of agitation led by Unionist leaders Sir Edward Carson and Andrew Bonar Law had so exploited patriotic and sectarian resentment at the prospect of Irish Home Rule that by 1914 the United Kingdom was on the verge of civil war. Jackson locates this movement at the end of a ‘long nineteenth century’, where communal and confessional identities were still as powerful as class, and where native hostility to Catholicism and Irish migration still prevailed. This work shows that the rhetoric and street-theatre of Carsonism had as much resonance in Britain as ‘Protestant Ulster’, where enormous crowds turned out to protest against Home Rule throughout Great Britain (and not just in the sectarian cauldrons of Liverpool and Glasgow). For Jackson, the study of these massive demonstrations becomes a way of capturing the opinions of those rendered voiceless by history, and shows how the Ulster question allowed Conservative politicians to bridge the gap between elites and masses, and elicit a degree of popular enthusiasm unmatched in the years before the Great War. Daniel Jackson is to be commended for producing a monograph that significantly advances our understanding of the Unionist cause in Edwardian Britain, but Carson’s campaigns were only part of the story. ...this is a vital contribution to our understanding of the interconnections of Irish and British politics and suggests how a study of Irish political activism in Britain can add considerably to our understanding of broader political culture at the beginning of the twentieth century. One of the most important studies in British-Irish history to be published this decade. 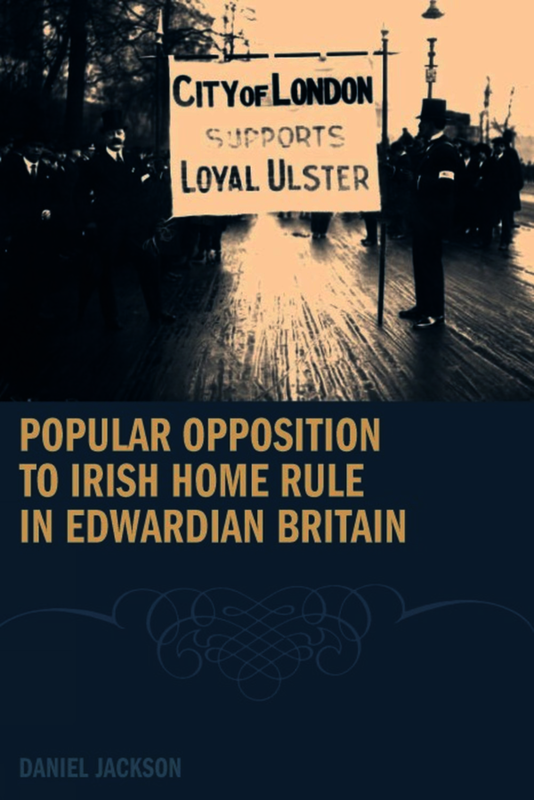 This is precisely the phenomenon examined by Daniel M. Jackson’s Popular opposition to Irish Home Rule in Edwardian Britain (Liverpool University Press, 288pp, £65 hb, ISBN 9781846311987). He argues that Conservative politicians like Andrew Bonar Law were able to bridge the gap with the British masses by exploiting patriotic and sectarian sentiment to such an extent that by 1914 the United Kingdom, and not just Ireland, was on the verge of civil war. Daniel Jackson works in policy development in local government. He has contributed articles to a number of journals including Transactions of the Historic Society of Lancashire and Cheshire.